The best selling board game in the world comes to life in this full-on, full day version where you become the property baron. No longer are you sitting in a room playing the board game but speeding your way around the London streets accumulating the cash, outwitting the other teams and gambling your investments. You will need all your cunning and strategy skills to work out a plan that will get you around the board in time and beat your rival teams. The more properties you collect; the more cash you make. Racing against the Monopoly clock, you’ll need to work together as a team, adjusting your plans, changing your strategy but always keeping one step ahead. To get you round the ‘board’ you will have unlimited use of the underground and bus network. Chance and Community Chest challenges will be posed throughout the day. 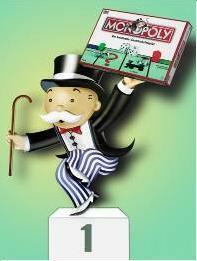 Complete the tasks when passing ‘GO’’ and boost your Monopoly bank balance, but you risk heavy losses and super tax fines. The winner is the team with the most cash.